One of the most useful gardening tools is, without a doubt, the garden claw. This versatile instrument comes in a wide variety of shapes and dimensions and it serves for more than one purpose. In fact, on the market, there is a wide variety of garden claws available. They vary in size, shape, and material. However, they are all used for mainly four purposes: cultivate the garden, aerate the soil, turn the soil, or remove weeds. Because garden claws are so different, many new gardeners are wondering how to choose the right tool for their needs. In this guide, I aim to show the main differences between the various tools and help you choose the right one. If you don’t feel like reading, use the links below to see some of the best products available on the market. Gardening tool manufacturers propose a wide variety of garden claws. They all serve the same purposes, but some are suitable for large gardens and lawns, while others are more indicated to use in small spaces or when cultivating raised beds. Full-size garden claw: this tool has the dimensions of a standard gardening fork. It is usually made of steel or other metal. The claw is fixed on a long handle usually made of wood or solid plastic. These garden claws are ideal to use if you want to remove weeds from your lawn, to cultivate a large garden, or to loosen and aerate the soil. Most gardeners also use them to turn the compost pile. Garden claw rake and cultivator: a solution ideal for those who have small gardens and also for those who want to make a square foot garden on a raised bed, the garden claw rake and cultivator is usually compact and easy to use. The claw is made of steel or metal and it is fixed to a short handle that provides an easy grip. The tool has compact dimensions and even the less experienced gardeners feel comfortable using it. Glove garden claw: also known as a garden genie, these claws are actually fingertips fixed on a garden glove. They are usually made of plastic and resin. The advantage of these claws is that they are really easy to use, especially for cultivating and weeding purposes. Garden claw cultivator: this garden tool is more similar to a comb than to an actual tool. It is ideal to use for raised beds or gardens with loose and aerated soil. They are ideal to cultivate seedlings but also to sow the seeds. Because garden claws are so different between them, choosing the right one is a daunting task. Nevertheless, there is no need to despair. Here is a list of things to consider before investing in a gardening claw. Purpose: the main thing to consider is the reason why you want to buy the claw in the first place. Do you have a large lawn? Is your soil loose and aerated? Do you need it to cultivate vegetables or to maintain the beauty of your lawn? For example, for a large property, a full-size claw is more indicated. A handheld garden claw is more suitable for small garden or raised beds. Glove claws are ideal for daily gardening chores and so on. Material: regardless of the purpose, the garden claw should be sturdy and well made. Choose a tool that is made of steel or another type of resistant metal. The handle should also be sturdy and ideally made of wood or metal. Ease of use: even if the tool is large and heavy, you should still be able to use it without hassle. The handle should be comfortable and easy to grip. Choose a non-slip model. If you choose glove garden claws, then make sure that they fit perfectly on your fingertips to prevent discomfort. With this in mind, let’s have a look at the best garden claws available on the market. To help you choose the right one, my selection includes the most popular models of each garden claw category. When thinking about a garden claw, the first tool that comes to mind is a full-size tool similar to a pitchfork. However, sometimes a small tool is more appropriate, especially if you want to cultivate seedlings. 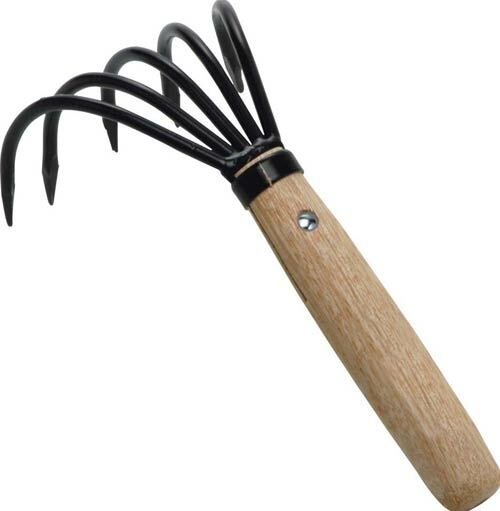 The Asano Japanese Ninja Claw Rake and Cultivator is a small garden claw suitable for a wide range of tasks including weeding, digging, aerating and loosening soil, and more. The tool has a padded oversized handle designed to provide an exceptional grip and that is comfortable to use. The claw is made of heavy-duty carbon steel that is resistant to rust and constant use. In fact, you will be able to use this garden claw even when digging through tough soil without having to worry about breaking the tool. To stand for the quality of their products, the manufacturer offers a lifetime warranty for manufacturing and material defects. Comfortable handle: this gardening tool is really easy and comfortable to use thanks to the ergonomic, anti-slip handle provided with a hanging hole. Blade: this garden claw is made of hardened carbon steel. It has a superior durability compared to similar products and will not break with ease. Great for flowerbeds: this tool is ideal to use for flower beds or for vegetable gardening if you use raised beds or square foot gardens. Multiple uses: this tool is perfect to cultivate, aerate the soil, loosen the soil, transplanting, and more. The balance center is not accurate and for this reason, it is sometimes awkward to handle the tool. Gardening is not always easy, especially if you have to deal with hard-packed soil after a few months with no rain. The Garden Weasel Gold Garden Claw Cultivator 91306 is a tool able to help you care for your property regardless of the conditions of the soil. This garden claw and cultivator is made of electro-coated steel and it boasts a patented claw head. In fact, the claw head has six angled tines that are designed to break up and crumble even the hardest soil. Thanks to this characteristic, you will be able to loosen and aerate all types of soil but also to blend compost or fertilizer. The head, on the other hand, has four adjustable heights while the handlebars are designed to provide a comfortable grip thanks to the vinyl coating. The garden claw can be used for a multitude of purposes that include weeding, blending fertilizer, turning compost, cultivating, and more. Adjustable heights: using a standard gardening tool is not always easy, as you will probably have to adjust it to your own size. Thanks to the innovative adjustable height of this garden claw, using it is a breeze. Lifetime warranty: this product is backed up by a limited lifetime warranty, which is a guarantee of the product’s quality. Easy assembly: putting the garden claw together only requires a few minutes and the operation is really simple. Blade: the tool’s head boast a patented angled-tines system that increases the claw’s performances on all types of soil. The claw’s head is rather compact, which means that it will take quite a while to loosen the soil if you have a large property. For those gardening chores that require you to work with grown plants, it might be easier to use a pair of garden gloves with fingertips claws. This type of gloves is usually perfect for digging, weeding, aerating the superficial layer of the soil, and more. These gardening gloves and claw are made of natural rubber and have strong fingertips made of ABS plastic. The gloves are designed to protect your hands from all potentially harmful elements, such as thorns or fertilizers, while the claws will help you care for your plants with no fuss. A great feature of these gloves is the flexibility. They are comfortable to wear and use, although they are strong. The gloves come in a universal size that fits almost all gardeners regardless of their gender and age. Comfortable: thanks to the flexible design, these claw gloves are comfortable to wear and easy to use on almost all types of soil. Waterproof: keeping your skin dry at all times is a breeze, thanks to the waterproof design. The gloves are made of natural rubber. Claws: the claws are strong and made of ABS plastic. A thing we like is that both hands are provided with claws, making digging or weeding easier. Universal size: these gloves are suitable for both men and women and usually fit well on hands of all sizes. Although this product is excellent, using the gloves claws on hard soil is almost impossible. Yard Butler TNT-4 Garden Twist and Tiller is another full-sized garden claw that impressed us. This 36-inch garden twist and tiller is designed to till soil for easier and quicker planting, but also to promote the free flow of air, water, and fertilizer. The claw is manufactured by Yard Butler in Mexico and it is made of reinforced steel. The design, on the other hand, is thought to allow gardeners to handle this tool with ease while the gravity center is extremely well-balanced. The claw presents a sturdy head with six angled tines. Thanks to this characteristic, this garden claw has impressive performances on all types of soil, including hard soil. Another thing we like is the ergonomic handle. Besides the well-balanced gravity center, the handle is manufactured to provide an excellent grip thanks to the rubber covers. Extra-long handle: engineered to reduce the effort of twisting, this garden claw boasts a super-long, ergonomic handle. Size: the claw’s head measures 36 inches, which is ideal to allow you to aerate the soil in no time. Thanks to the resistance of the material, you’ll be able to use the tool on all types of soil. Perfect for gardening chores: besides aerating the soil and cultivating, you’ll be able to use this claw for other purposes, such as turning the compost pile or to blend fertilizer. Lifetime warranty: the manufacturer offers a limited lifetime warranty for parts and manufacturing defects. The handlebar, although ergonomic, is sometimes hard to twist because of its straight design. Last but not least, a garden claw that impressed us is the Bear Paw Products Cultivator Claw. This small hand-held garden claw is perfect for mid-season gardening work, especially when you have to dig or weed the area between fully-grown plants. The claw is different from all the others because of its peculiar, comb-like design. Nevertheless, using this tool is a breeze thanks to the ergonomic design that promotes the natural movement of the hand and arm. Another feature we like is the sharpness of the claws. The tool is great for a wide range of chores including weeding, breaking up the soil, removing debris, and more. The claw is really resistant and made of metal-replacement nylon. Thanks to the choice of the material, the tool is surprisingly lightweight for a durable gardening tool, it doesn’t rust and can provide excellent results every time you use it. Design: the comb-like shape of this gardening claw promotes the natural movement of the hand and arm, reducing fatigue. Never-set-down: another feature linked to the design is the fact that you will never have to set the tool down, not even for gathering debris, picking up rocks or weeds. Made in the USA: this gardening claw boasts a USA design and is engineered in Utah, which is a further guarantee of quality. Satisfaction guarantee: the manufacturer claims to provide a full refund or a replacement if you’re unsatisfied with the quality of your product. The tool is sometimes difficult to use if you have to reach more remote corners, because of the lack of a longer handle. 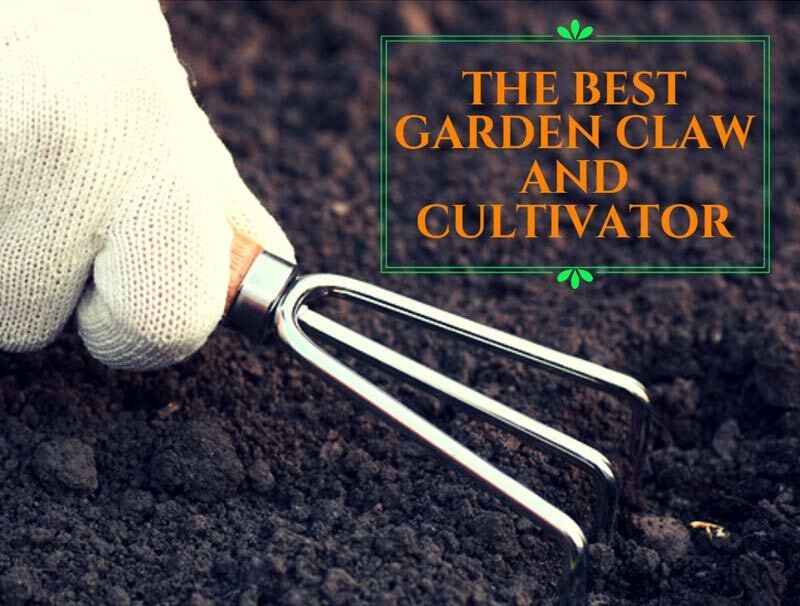 Choosing the right gardening claw is a matter of needs and preferences. Nonetheless, I believe that a strong and heavy-duty tool should always be preferred over the others. For this reason, in my opinion, the best garden claw and cultivator available on the market is the Garden Weasel Gold Garden Claw Cultivator 91306. This tool is designed to help you care for your property regardless of the conditions of the soil. The head of the claw is made of electro-coated steel and the design is patented. In fact, the claw is designed with six angled tines able to break up and crumble all types of soil. Moreover, the head has four adjustable heights and the garden claw can be used for a multitude of purposes that include weeding, blending fertilizer, turning compost, cultivating, and more. For all these reasons, this is, without a doubt, one of the best products to consider.